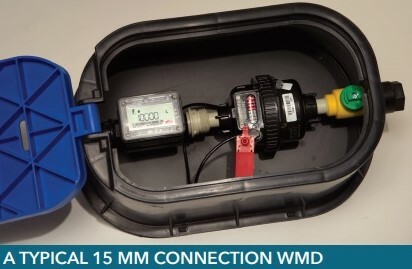 Home/Blog, Water Wise/How to read your water meter? A number of people have asked how one reads the water meter. Confused by the number of dials, spinning wheels and then the bar of digital numbers. What does it all mean? But first! Do you know where your water meter is? 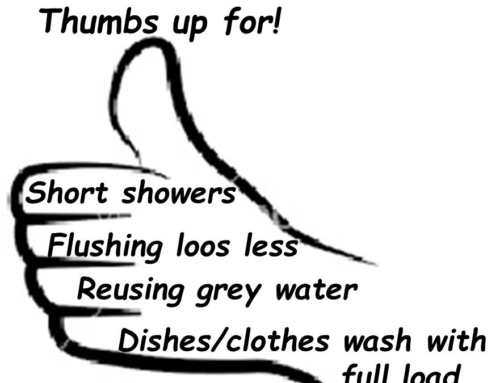 Do you know how to switch off your supply if a pipe bursts or as happened to my neighbour this week – the flush mechanism of your toilet sticks and gushes drinking water into the toilet bowl. The drought and stricter water restrictions make it even more critical that we also understand how to read our water meters and how to use them to check for leaks. If you switch off all taps and the little black wheel is turning – then the chances are you have a leak. 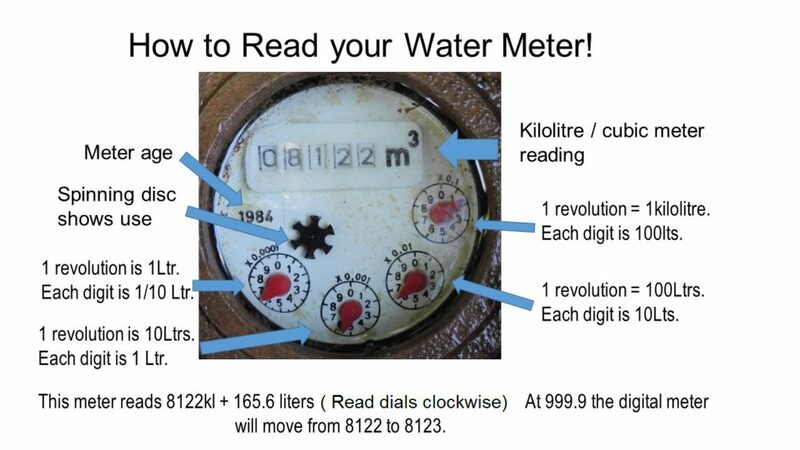 See the diagramme of my old water meter annotated to explain what all the dials do! Our Constitution identifies access to clean water as one of our human rights. 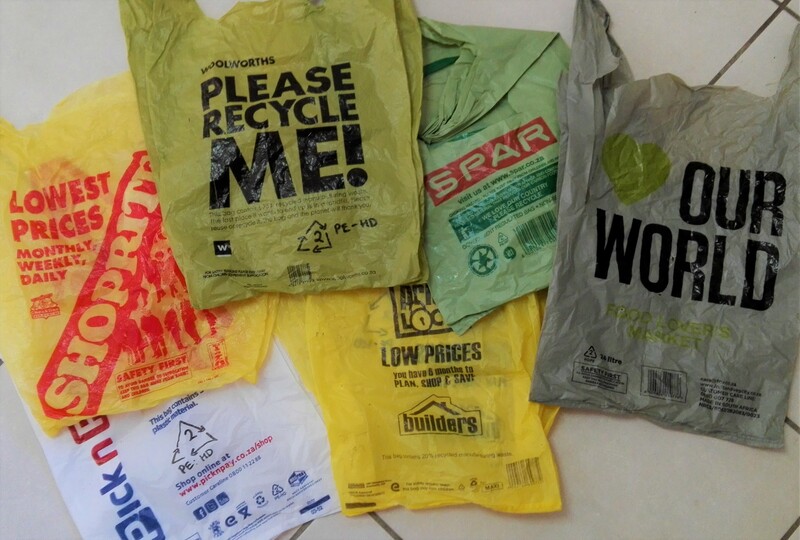 Many municipalities translate this into a free allocation of 6 kilolitres per household per month. In acknowledgement of the severity of this drought nationally AND understanding that the Climate Change scenarios for South Africa predict more frequent severe droughts, the Dept. of Water Affairs is reviewing the allocation of water by local authorities. As a result in Cape Town, from 1 July 2017, affluent households will no longer get a FREE allocation of 6 kilolitres. This is intended to encourage a culture of efficient use of water by homes with large gardens and pools and by people who can better afford rain tanks and alternatives to municipal water. The new charge is also (possibly) the need compensate for the reduced revenue from the decreasing sale of water to pay for maintenance and new water infrastructure when the higher fees associated with the restrictions are lifted. Hopefully this drought will have a lasting legacy of efficient water use. Many of us have learnt lessons in desperate times!!! Xanthea Limberg, CT Mayoral committee member for water services was quoted on Cape Talk as saying that the higher water tariffs were designed to compensate for reduced consumption so that the City did not loose revenue to maintain the water infrastructure. 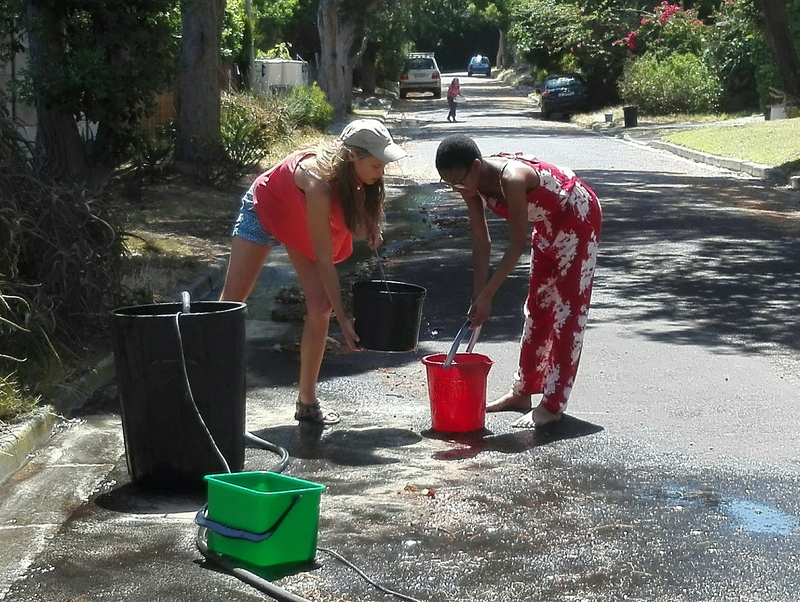 However, because of a slow response to the Level 2 and then the Level 3 water restrictions, the City’s revenue from water sales had increased significantly by R2.54 million over the past 12 months. This extra funding was a welcome injection of money to speed up the City’s repair of old water infrastructure. hats wrong the one they mark as liters is 10ths of a liter, from top right counterclockwise its hundreds of liters then tens of liters then liters and the last dial on the left is tenths of a liter. That dial reads 8122 kilo liters 165.65 liters. One revolution is one litre and as you correctly say each position around this dial marks 1/10 of a litre. I have changed the annotation on the diagramme so it is clearer. Thank -you for pointing out the potential confusion. Thank you, the way its annotated now is super clear. How do I read my honeywell home water meter C-BKX8055? 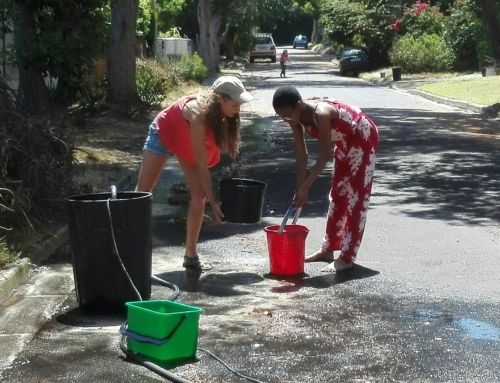 Hi I have added an explanation at https://greenaudits.co.za/new-cape-town-water-demand-meters-causing-confusion/. Hope this helps! What could be useful would be a second image of the same meter, but taken a few days later, showing (obviously) some usage and a calculation for the difference so the reader can see how the dials have moved, and hence how the actual usage is arrived at. Good idea. 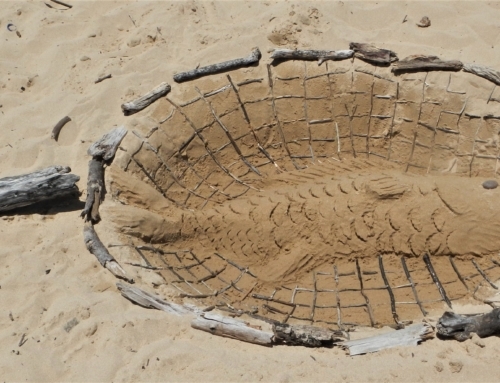 But as we are using so little water will have to wait a few weeks to see a measurable shift. Should say “read dials CLOCKWISE”, not “read dials ANTI-CLOCKWISE”. The spinning disc ‘spins’ all the time even though I am not using any water. Who should I contact about this? hi Susan, sounds as if you may have a leak on your side of the meter and you need to attend to it as soon as possible so as not to waste water and possibly be fined. Do you know where your isolating tap is? If so switch off your water supply and watch what the meter does – it should stop spinning. If not there is potentially a leak between the meter and your tap. As I understand it leaks on your side of the meter are your responsibility – so you need to get a plumber to fix this. Leaks on the city side of the meter are the City’s responsibility – but these leaks should NOT be turning your meter dial. If the leak is somewhere on your property and you can’t see dripping taps or toilets you may need a plumber to find it. To check for yourself – take a reading at night after you have stopped using water and then check again first thing in the morning. 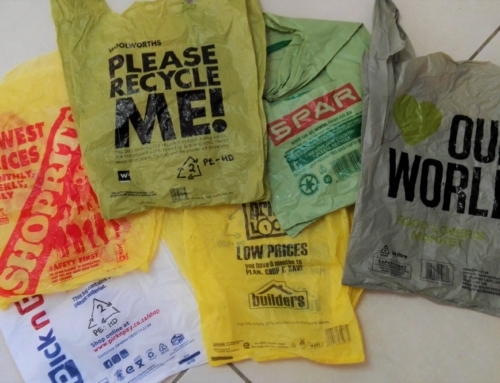 See what the consumption difference is – it should be nil. I’m furious! My husband and I really try very hard and save every drop of water that we can. We average 50 litres each per day, and am working on reducing that. 6 months ago when we discovered that our water meter had a slow leak, we reported it to the City of CT immediately and they replaced it immediately. However, without spilling more than a cupful at our gate, they replaced it with a meter which already had a reading of 609 litres on it. I phoned in to complain and emailed and sent photos of the old and new meters on the day of repair, but to no avail. That 609 litres remains for our account. We are paying for an extra 6 days or 20% of a month’s worth of water that we didn’t use! What a slap in the face. Apparently because its less than a kilolitre it doesn’t show up on either council workers readings or the readings that I phoned in. Please can anyone advise me on how I can have these 609 litres reversed off of our account? hi,It looks like sloppy workmanship by the City. The 609 litres will result in you reaching the 1000 ltr mark (1 kilolitre ) much faster and therefore the first payment mile. You can carry on protesting or just accept that you will pay for it – probably at the rate of R4.56 per kilo litre for consumption up to 6 kilo litres. Well done for being a water warrior. If all Captonians used 50litres per day we would reach the City’s target of 500 million litres consumption per day and delay the dreaded D- Day of the dams running dry. This is an INCREDIBLY helpful article! You have explained everything perfectly! Thank you, THANK YOU for posting it! Good day, who do I contact in CoCT to have my existing Water meter cleaned. The numbers are covered in Algae from the inside and now the Water reading man can not read the numbers on the dials. I was told it is just a matter of taking the meter off and giving it a good shake and flush. I do not need to replace the meter. 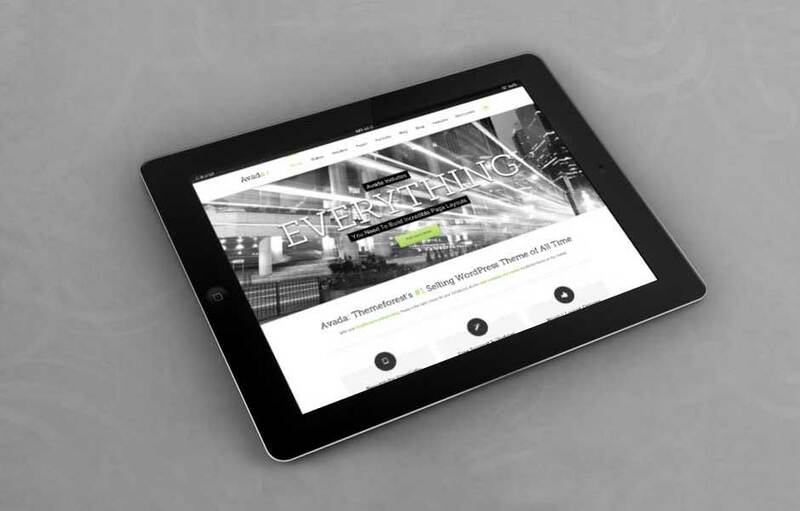 Please let me know who I can contact at CoCT. Lists a number of contact options as follows. Log a service request at https://eservices1.capetown.gov.za/coct/wapl/zsreq_app/index.html. Hope you come right soon. Thank you for this helpful page. I would like to know if water meters in Cape Town include the outflow or the sewage/waster water flow as well. I am calculating our water usage and need to know if I should divide my reading in roughly half to really understand our usage. Thank you. 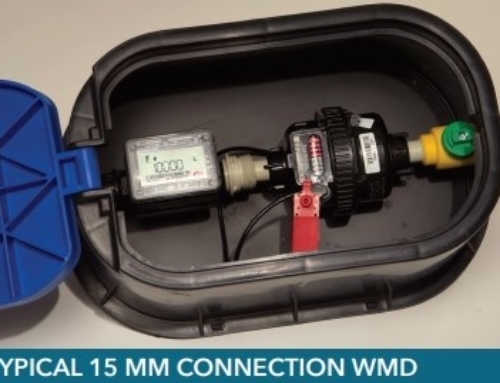 Hi, the water meter measures the total water consumption of the building – not the outflows. The inflow includes the water you flush if you are flushing your toilet with the municipal supply. To work out how much water you are flushing you need to measure the volume of your toilet cistern in litres and multiply this with the number of times you flush. To measure the volume of your toilet cistern you need to flush and then stop the inflow. then manually fill your toilet using a container of known volume. A litre jug or bottle works well. 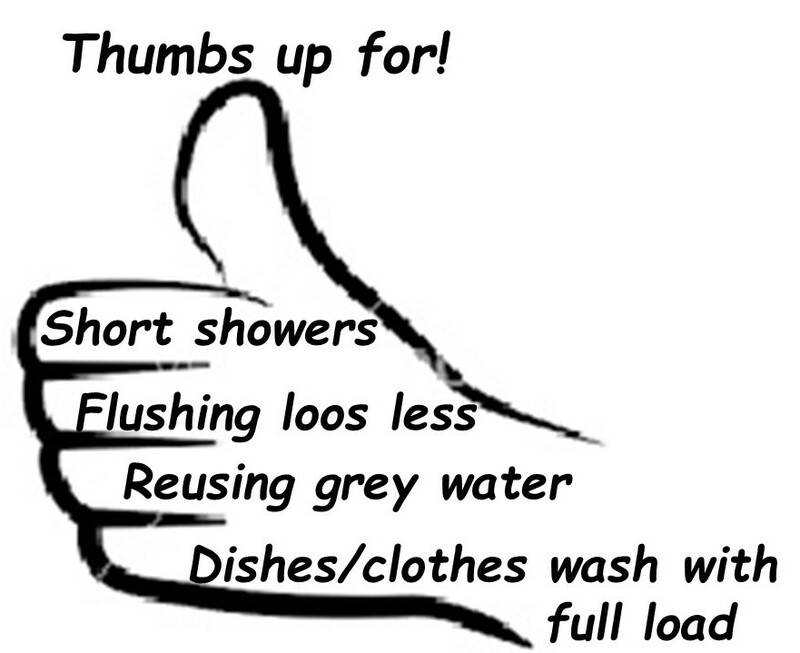 Hopefully you are managing to fill your toilet cistern during the drought with shower, washing machine water, swimming pool or borehole water. We need to save as much potable water as possible. hope this helps. Thank you a most helpful article. I even called the Municipal help line but got nowhere. Good morning, We recently had individual water meters installed in our Estate. Owners and tenants still pay the same for water every month. I am doing the readings. Just correct me if I am wrong regarding the readings. Hi Flat 102’s meter appears to have recorded 37 kiloliters (37000liters) and one hundred and twenty three litres. The City charges for the kilo litres used each month. Presumably the 37 kilolitres was used over a number of months otherwise the consumption is excessive. Flat 22’s meter appears to have recorded 4 kiloliters (4000liters) and four hundred and sixty two litres. 4000litres for one person per month is way over the old prescription of 87 liters per person which equals 2610 litres per month. Now the target is 50liters per person per day. The households in these flats need to reduce their water consumption significantly – or they or the complex will be liable for high water costs and we will all be facing Day Zero with only 25litres that we have to collect ourselves. .
Hi, we just want to know if you can let us know how many liters there is in one unit of water? We live in a security complex with individual water metres, but get our reading in units? As the City charges for water in units of 1 kilolitre which equals 1000 litres I assume that the units you are being charged for are multiples of 1 kilolitre units. Good day.,I hope my text find you well. I’m in desperate need of advice regarding our residential water meter. Our problem started a few years back when local municipality decided to move and replace all existing water meters and replacing them with the current plastic ones. At first our meter was inside our our yard and placed it on the outside.. I would like to know why is there still a stop valve inside our yard. He we want to stop the water flow we need to close both valves.. And shortly after we noticed excessive increase on our monthly water bill. Various times we query our bill and various times we got told that our reading was incorrect and that we don’t have to pay the entire Knott stated on our bill.. Please tell me What’sthe reason that we need two stop valves.. Prior their change everything was perfect. I checked with our neighbors and theirs differ from ours.. He they want to kill or completely stop their water flow..they only close the 1 valve on their meter ..if we intend on completely stopping our water flow.. It’s require to turn both valves the existing ~+the new valve on the plastic never.. Is this normal? My meter seems to be inaccurate. It is a 2007 model. The black disk has just one small projection but the disk does not spin. If I turn everything off for a few hours the reading on the meter stays static as expected, so there are no water leaks. If I fill a 5 liter bottle it correctly measures 5 liters on the liter scale wheel. However, when the meter it is running full speed while supplying to the house while various outlets are being used it seems to register about 29% more water than what it should have. I have measured how much water is used to flush our toilets, fill our baths, run our showers and how much water our dish washing bowls are using. The tests that I have done involve taking a meter reading followed by a detailed logging of all water use over say 8 or 10 hours. These tests show at least a 29% over-reading on the meter. I have also noted thatthe click-over on the cubic meter reading seems to be premature to the completion of the full revolution of the 100 liter wheel. There are also signs of water marks all over the face of the meter. Time for a replacement? If a new meter reduces the consumption by 29% would I have a case for a claim of over-metering and how would one go about calculating the losses I have been subjected to over the last ten years? Good question. If your financial situation means that you qualify for 10,5 kiloliters free water per month this will significantly reduce your water bill. If you do not qualify for the subsidized water for cash poor households than I am not sure what the official City options are for two households on one property unless it is registered as a multiple dwelling or the property is subdivided. If you find out from the City please let us know. Just want to know why the City charges for water in kilolitres e.g. if you used 2626, 000 or 2626,999 kl of water you are still billed for 2,000 kl. Is this not unfair? Hi Alice, because the meter continues recording you will be billed in your next payment for the 626lts as well as the additional consumption recorded for that month. This is frustrating when you are committed to saving litres but pay for 1kl at a time. Hopefully in the future and eventually we should have smart meters which can be read electronically and which will charges us for exact consumption.